The International Research Center for Nuclear Materials Science (formerly Materials Testing Reactor Facility) of the Tohoku University Institute for Materials Research was established in June 1969 to perform basic research on nuclear fuel, nuclear reactor materials, and related aspects using the Materials Testing Reactor and other systems of the Japan Atomic Energy Research Institute. The Materials Irradiation Engineering Division was also established at that time and merged into the IRC, for collaborative usage operations and research activities. This was preceded in 1957 to 1962 by the successive establishments of the Rare Metals Science Division (originally proposed as Nuclear Reactor Fuel Metallurgy), the Radiation Metal Chemistry Division, the Nuclear Reactor Materials Metallography Division, the Nuclear Reactor Materials Processing Science Division, and the Radioactive Metal Physics Division , and research at IRC has ever since been performed in close collaboration with these nuclear energy materials research divisions. The early foci were research on light-water reactor vessel steel and fuel cladding tube materials, development of materials for fusion reactors and research on their irradiation characteristics, research for development of ceramic matrix composites, and basic research on positron annihilation methods. Special research on nuclear fusion was begun in FY1980 and in FY1982 the RTNS-II project was initiated as a Japan-United States collaboration in fusion science and technology. Throughout, the IRC grew rapidly in importance as a center for research on irradiation of materials for fusion reactors. It has also played an important role not only as a domestic post-irradiation test center in the FFTF/MOTA project as stage 2 of the Japan-United States collaborative work and in the Stages 3 and 4 Jupiter Projects I and II, but also as a core facility for research on nuclear fusion reactor materials. The actinides experiment building was completed in 1989 and its collaborative usage was begun, enabling the IRC to begin substantive research on nuclear materials, a key objective of its establishment. More specifically, it opened the way to vigorous research by the IRC staff and guest collaboration usage research on new nuclear fuels with hydrides, on processing and disposal of spent nuclear fuel, on the physical properties of actinides, and on related aspects. With alternation of division members, what had been six sections of the Atomic Energy Materials Research Division and the initial-stage Materials Irradiation Engineering Division, became four divisions: Radiation Metals Chemistry Research, Nuclear Energy Materials Engineering Research, Nuclear Energy Materials Science Research, and the newly added Materials Irradiation Engineering Research Division . 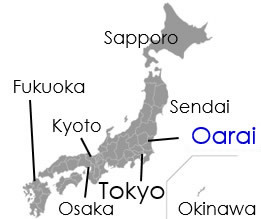 The divisions located in the Oarai District formed two divisions: Materials Irradiation Engineering Research and Radiation Metals Chemistry Research. The division located in the Sendai District also further strengthened its relation to the IRC, and one center effectively took on its present four-division configuration. The Radioactive Metal Physics Research Division has since its inception used neutron beams as a research tool, with research not necessarily limited to nuclear energy materials.